Here’s another chance to own a butterfly-roofed Palmer & Krisel-designed home in Racquet Club Road Estates in Palm Springs. 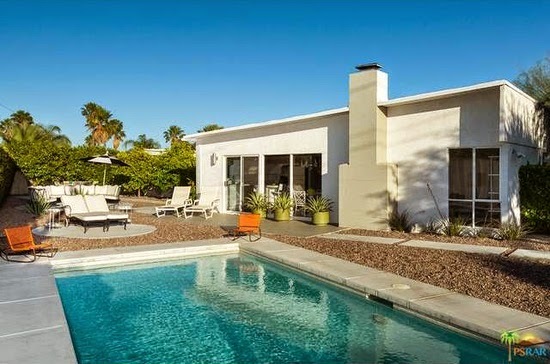 It’s a standard 1,225 square-foot floor plan with 3 bedrooms and 2 baths all on a 11,300 square-foot cul-de-sac lot. The front of this home features an open-slab driveway and separate front walkway surrounded by a simple rock and fountain grass landscape. 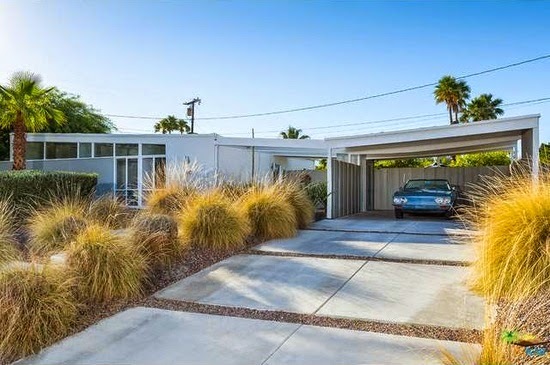 The open two-car carport helps define and enhance the butterfly elevation, and the entry patio feature some striking desert specimens set amongst a floating slab walkway. Inside, the vaulted-beamed ceilings are complimented by polished concrete floors and the massive original signature-Krisel fireplace in the living room with sandblasted block. It appears as if the rear living room clerestories have been removed – potentially due to sun issues. This could potentially be mitigated through additional landscape or sunscreens, should the clerestories be desired to be restored. 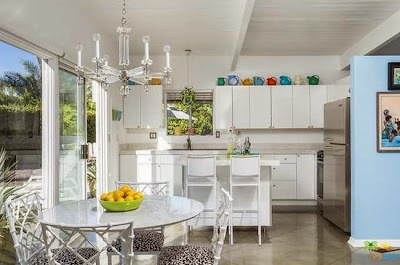 The kitchen retains original layout, but has been updated with white on white counters and cabinets for the classic Palm Springs look. The bathrooms retain their original bathtubs and tub surround tilework, which appear to be in excellent condition. 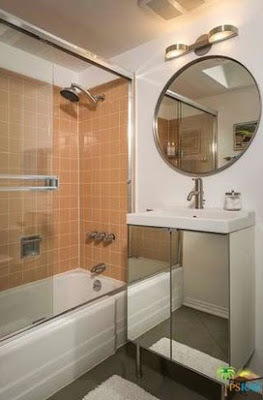 The master bath features a signature Krisel sunken tub design, where a portion of the solid tub has been sunk into the foundation of the home. All other bath fixtures have been updated; it’s pretty neat to see that these owners took the time to preserve the existing tubs and tile. Outside is an entertainers dream, with a sparkling blue swimming pool, citrus trees, conversation fire pit, and built-in bar-b-que. There’s even a second outdoor fireplace next to the built in bar-b-que. 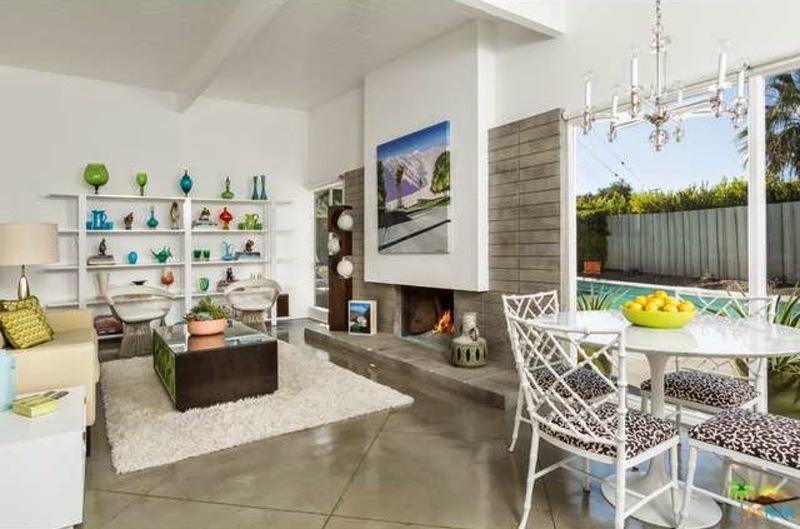 There’s also several small, intimate patio areas in addition to a sculpture pad. This home is new to the market and definitely a winner, evoking all that we love about Palm Springs.